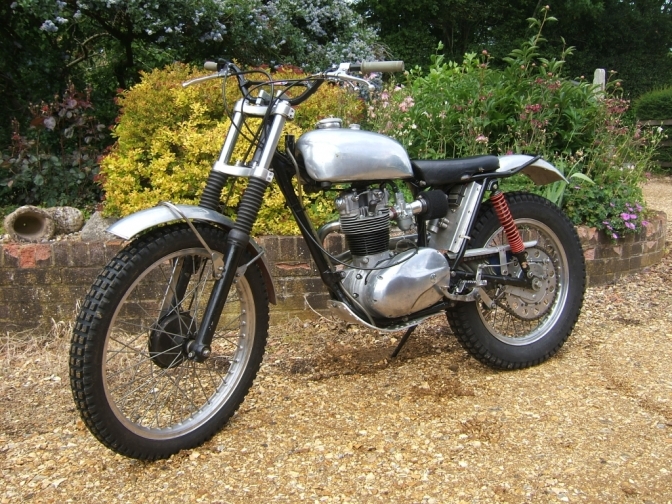 I nice BSA C15 T owned by the same family for years and with a history that links to another BSA on this web site. The Henbest Family's Cotswold BSA C15 T.
This is linked to another "Cotswold" BSA on this site? Here Is the story Tony Henbest told me. The Henbest Family “Cotswold” BSA C15T. The History of the Machine. My brother bought the bike around 1998, it was bought from a gentleman in Neath called Haydn Thomas, we can’t remember exactly but have photos and results of the bike from around this time. He paid £1300, a not insignificant amount of money back then. The reg number is PSU290 and it is/was a genuine C15T frame, registered first in March 1991. The bike at the time was fitted with a WD B40 motor, REH back wheel, and Suzuki front. My brother in the Southern Centre predominately then rode the bike with Waltham Chase and in the South Western with Somerton and Bath classic. Unfortunately my brother had a car accident in 2000 and a number of operations on his leg, so was out of action for a couple of years, during this time, he kindly loaned it to me and I rode it a number of times, generally in trials that preceded a motocross the following day. I bought an original Harry Foster "Otter" and then started riding this; a lovely bike and I should never have sold it. Following his car accident my brother wanted something lighter, easier to start and that required less maintenance due to his weakened leg. We also bought a pair of the revised Faber "Otter" trials bikes, built and rode these around 2005. Courtesy the Late Gordon Francis? Here is one of the Faber Otters in a Somerton Classic trial, on the 2nd of April 2006. However in our opinion they were long, high and did not handle as good as the "Cotswold". The Cotswold remained in the shed, having it’s wheels swapped for Triumph Cub ones, and the forks to Betor. Then my father came across a BSA C15G motor, this is what the bike should have had in it according to the logbook and so the transition began. 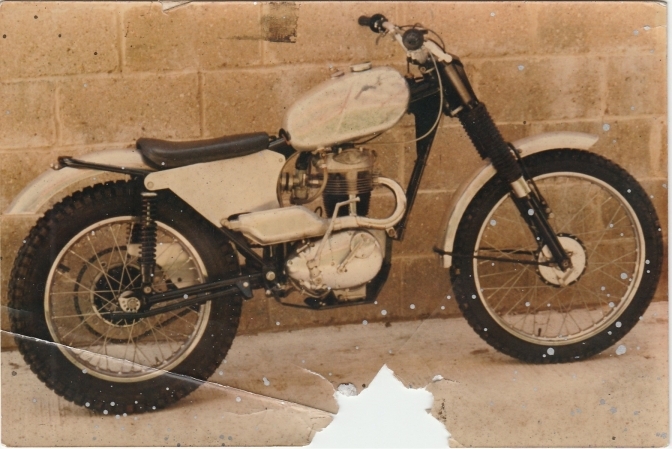 A number of years passed and various bikes were ridden in trials mainly modern bikes in modern trials. The "Cotswold" remained an ongoing project, receiving little and not very often attention. On stripping the "Cotswold" down, the frame was cracked through fatigue in a number of places and required extensive repair. It also had leaked oil badlyhiding some of these cracks. My father, who brazed the frame back together,also widening the swinging arm at the same time,as this was carried this out. 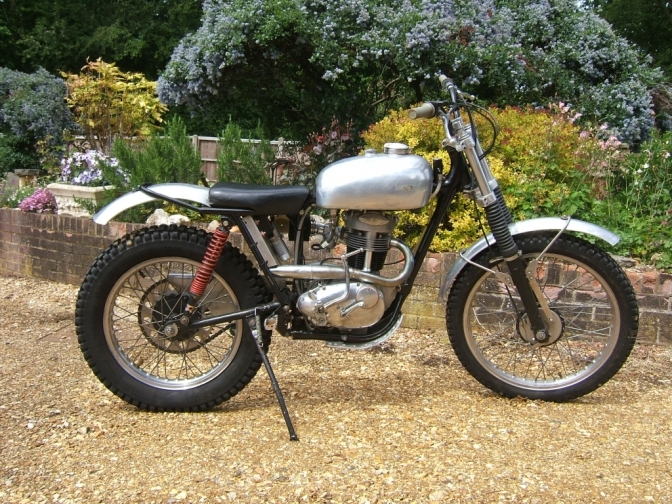 Towards the end of 2014 and a desire to return to Classic Trials, my brother dug the "Cotswold" out again and asked if my father could make a concerted effort to finish the bike. So we did, my father completing the frame repairs and building an has new BSA C15G motor to replace the B40 unit removed many years before. 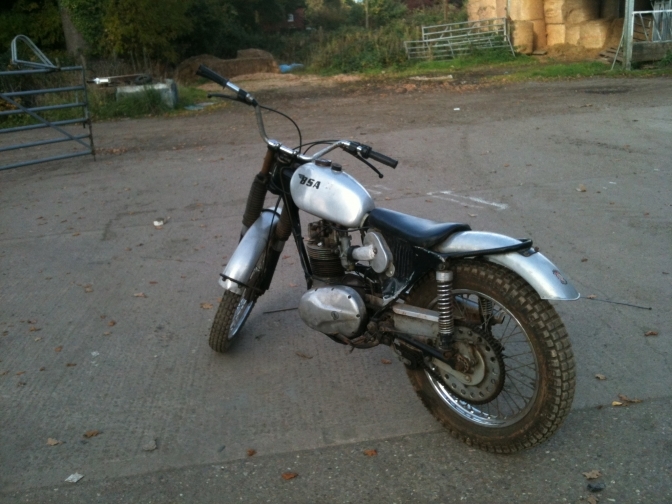 The result are the pictures I sent to you a few months back of the "Cotswold" Trials bike finished. 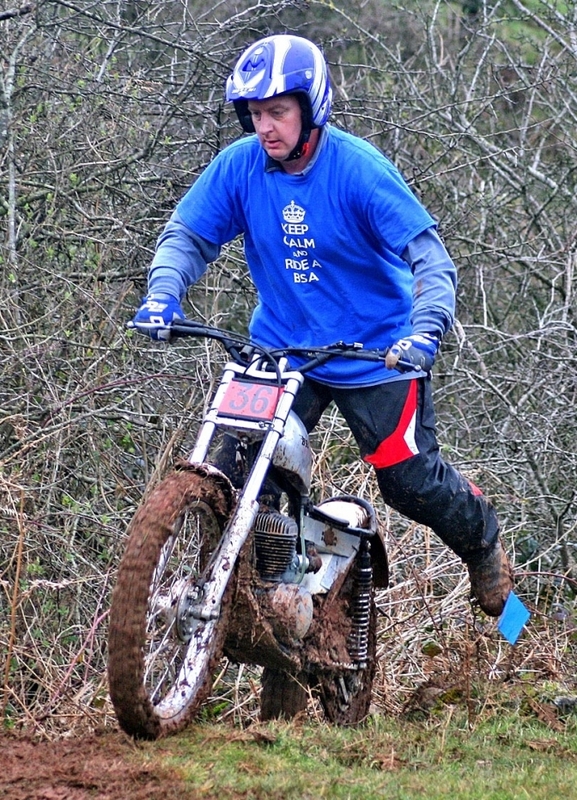 The bike has been ridden 3 times recently, the British Bike 2 day event at Priddy. The Eurocup with Golden Valley, and most recently the Rider Friendly series with Roger Painter. It performs faultlessly, steers, handles and grips incredibly well, other than being a little heavy it is more than capable of competing with today’s ‘very trick’ offerings while retaining its Classic and Traditional look and feel. All the very best and thanks again for offering to put this on the page. Photo Courtesy of Stuart Wigmore for taking the picture ,and Deryk Wylde for letting me use it. 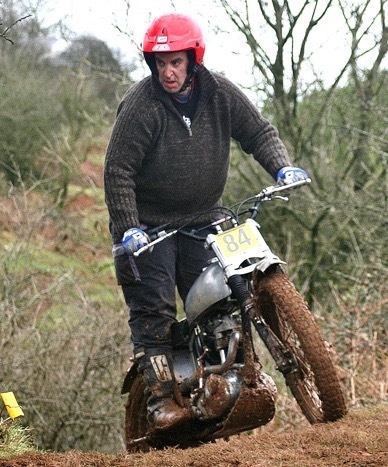 The photo is of Alan Henbest on the BSA C15 riding in the Somerton Classic Trial at lambs lair. 2016. Thanks Tony for the story. Photo Courtesy Stuart Wigmore again and Deryk for its use. 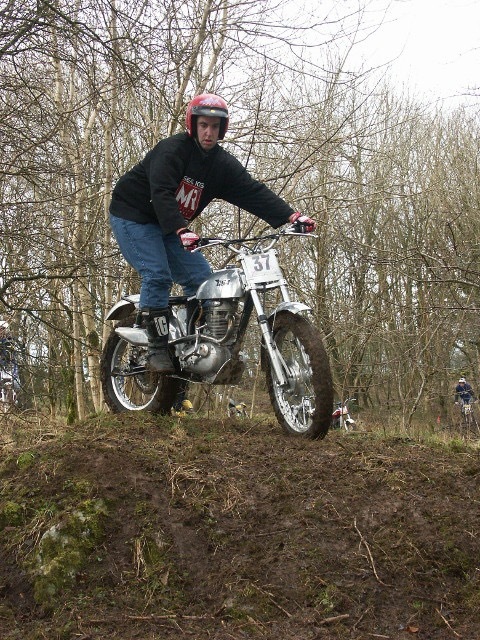 Tony Henbest riding His BSA Bantam at the Somerton Classic again at Lambs Lair. 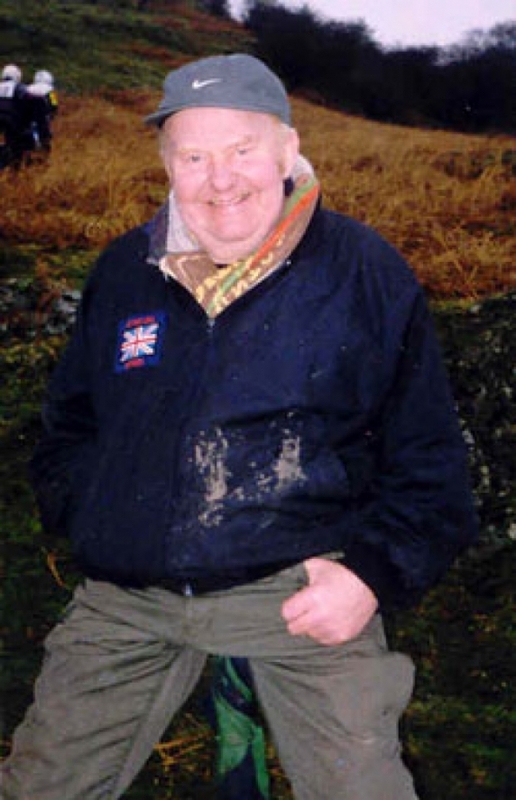 What you may not know, is that the Thomas family supplied Local Hero, Wilf Couldwell with a BSA to compete in the 1991 TMX British Bike Championship, the one organised by old friend Deryk Wylde. And Gareth Thomas bought at least two "Cotswold" Hubbo BSA's for this purpose. 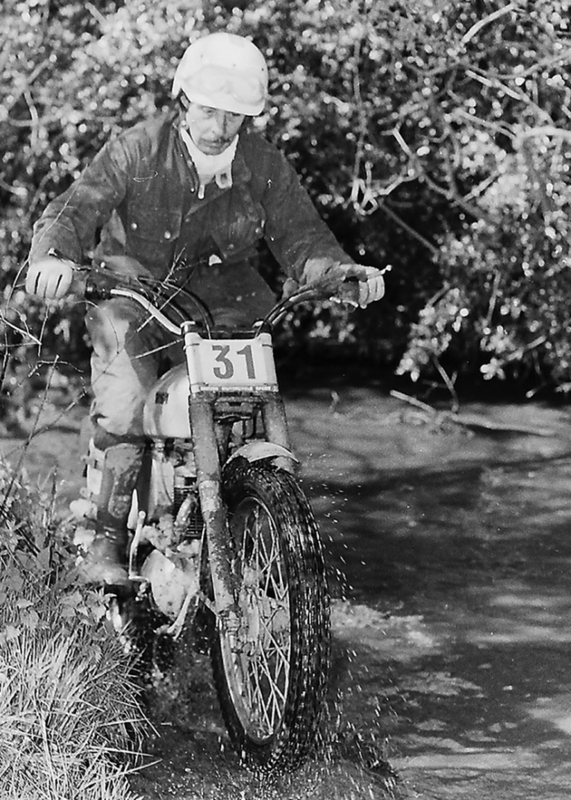 This is Wilf on one of the "Cotswold" BSA". Photo Offroadarchives. This could be one of them. and it could be the bike that you and your family now own. Wilf went on to win his class in the British Bike Championship that year. The bike that it is linked to ? Well Andrew Paxtons "Cotswold B40" BSA. Deryk has the story about "The Red Haired Rocket" (Hubbo) in the forth coming ORR-e Mag. We will update this page when we get a further report on the bikes performances from Tony, and Alan Henbest. Now just Check out this story the Henbest Family have sent me on the "BSA Otter Dot Com Otter" page. Photo Courtesy the Henbest Family. This is the BSA C15 "Otter' built by Keith Henbest. and now in our camp for safe keeping. I thought I would update you on progress with the Foster "Otter". Well as you know I stripped the bike down to carry out the rebuild. 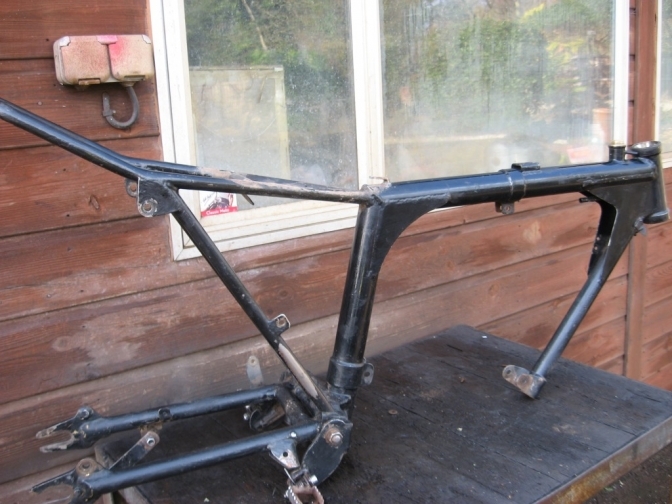 The frame when cleaned still had most of its original black enamel finish still on. and you could say as good has New. Everything as I took it apart,was as though it had been assembled a couple of weeks before, and just dirty. This again was as New. the piston could have only has you say ran a few trials. And needed hardly any cleaning. I honed the bore just to take out a couple of rust marks where the piston had been stood. The clutch although stuck with the New oil still without any colouration, was stripped, again as new, as was the rest of the primary drive. So the plates were just cleaned and reassembled, the only problem with reassembly was starting the spring nuts, as these were pattern parts, and the threads were not as long as BSA ones. 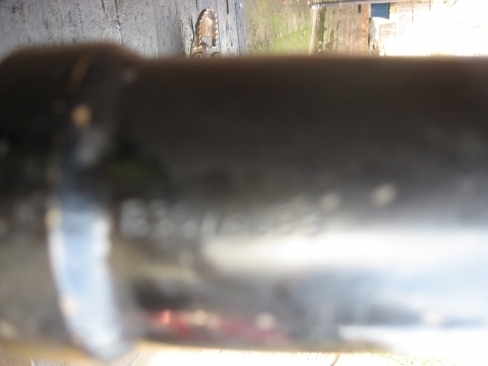 There was also a "H" in marker pen on the crankcase side of this case, the cover had been welded in a couple of places and no gasket was fitted; just the silicone that was used at the time. The valves in the head were ground in , not as though they needed it and fitted nicely into the sleeved valve guides. this again was stamped with a "H" as were most of the other parts. So the head and barrel have been refitted. and the rocker cover with the valve lift is ready to be refitted. The timing side cover was removed but I decided that there was no need to delve further as the gears turned sweetly and seemed again to be New. The only glitch was that the clutch push-rod split bush had become loose and had burred the end of the bore where the actuating rack runs, this had probably resulted in the clutch not working. I wonder if that is why the bike had stopped being used? and I have cleaned the galvanised spokes up for reuse. The hub was stripped ,again as New, and sealed bearings fitted with the inner seal removed and the hub filled with New grease, the steel seal was fitted with a circlip to stop it moving. Brake plate had been a karky ex military cub unit sprayed silver. And the shoes were New green linings, with saw marks across diagonally. So that is where I have got to, the Tank has been cleaned and polished and The SM Ossa seat stripped out so that I can take a mould from it for the production Foster "Otter's'. Back wheel and making New alloy side covers to your pattern, even with the louvred vents. After cleaning of the louvred alloy panels, I found that they had been made using a old Barclaycard sign. this is what Keith said. Regarding the side panel I can explain that because at that time I was working in a garage, and when any of the signs were changed I would acquire them, and many were converted into air cleaners/ side panels and even oil tanks. Thanks for building a superb bike Chaps. Well the update is that because of me buying his old bike, he told me that he had always regretted selling it, and it was an only "needs must" situation at the time. So the man with new enthusiasm for the Foster Otter as gone out , and bought another Foster second hand frame, to build himself another Otter to replace the one he had to sell. Yes that's a Foster Otter frame Keith. Keith this is how I interpret the number on the headstock. I will check with Carol. 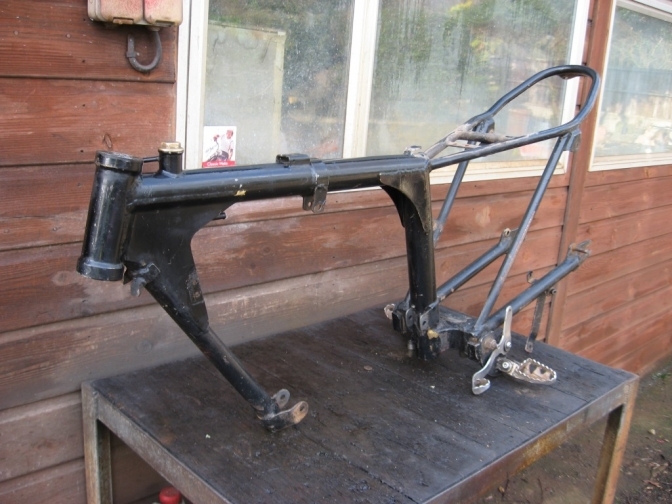 So We now look forward to the build story and photographs of this the second Foster BSA Otter Keith will have built. 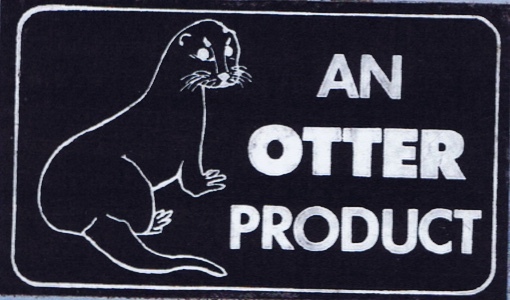 And there is a genuine Foster Otter Product head badge here waiting for you Keith.